We’d love your help. Let us know what’s wrong with this preview of The Outlander King by Hilary Rhodes. The story of The Lion and the Rose and the Norman Conquest continues in this spellbinding new historical fiction series from author Hilary Rhodes, pulling back the curtain on the lives of two remarkable women connected across centuries: Aislinn, a seventeen-year-old English girl caught up in the advancing army of the “outlander king,” the man who will become known to histo The story of The Lion and the Rose and the Norman Conquest continues in this spellbinding new historical fiction series from author Hilary Rhodes, pulling back the curtain on the lives of two remarkable women connected across centuries: Aislinn, a seventeen-year-old English girl caught up in the advancing army of the “outlander king,” the man who will become known to history as William the Conqueror. Thrust into the center of the new Norman court and a dizzying web of political intrigue and plotting princes, she must choose her alliances carefully in a game of thrones where the stakes are unimaginably high. Embroiled in rebellions and betrayals, Aislinn learns the price of loyalty, struggles to find her home, and save those she loves – and, perhaps, her own soul as well. To ask other readers questions about The Outlander King, please sign up. Selma, an Oxford University student, is researching the medieval “Aetheling” manuscript. As she is reading, we learn the story of Aislinn. She joins William the Conqueror’s camps alongside her twin brother. When William finally defeats the English, she is forced to become a maidservant to the defeated English king, Edgar. Aislin eventually finds herself swept amidst the danger, treachery, and political intrigue within the Norman court. Realizing that she is a pawn between two English kings who s Selma, an Oxford University student, is researching the medieval “Aetheling” manuscript. As she is reading, we learn the story of Aislinn. She joins William the Conqueror’s camps alongside her twin brother. When William finally defeats the English, she is forced to become a maidservant to the defeated English king, Edgar. Aislin eventually finds herself swept amidst the danger, treachery, and political intrigue within the Norman court. Realizing that she is a pawn between two English kings who seek the crown of England, Aislinn is forced to fight for her own destiny and to escape the danger surrounding her as she tries to find love, peace, and happiness. Aislinn is very strong-willed. She joins William the Conqueror’s camp very reluctantly because the only family she has left is her twin brother. She joins them as a healer. She has a strong dislike for William the conqueror, yet she knows that there is some goodness in him. Aislinn is very intelligent, and I like how she senses the political machinations that are surrounding her. She is very tough and sometimes she has to make hard choices to save those she loves. She can sometimes be cruel and unforgiving to those who hurt her. Another thing I like about her is that she knows she must choose her loyalty carefully, for her choice will bring about unforeseen consequences to her and to her loved ones. She is always trying to shape her own destiny. I was really fascinated with Aislinn’s story. It was beautiful, raw, poignant, heart-breaking, and an emotional read. Aislinn was such a strong character that it kept me invested in the story. I did not like how in the middle when Aislinn’s story ended in a cliffhanger, and it jumped to the modern story line. I found the modern story line to be very annoying, and it felt like a long intermission. It did nothing to enhance the overall plot because nothing happened, and I think it should have been left out. I was so interested in Aislinn’s story that I was eager for her story to be picked up from where it left off .I advise readers who enter the modern story to skip it and return to Aislinn’s story. Overall, this story is about love, loyalty, choices, and redemption. The historical epic is filled with fast-paced action with a strong heroine at its center. The story is very well-written, and it is clear that the author has done her research. I am excited to read the next book for I am interested in what happens to Aislinn. I recommend this book to those who are interested in William the Conqueror. 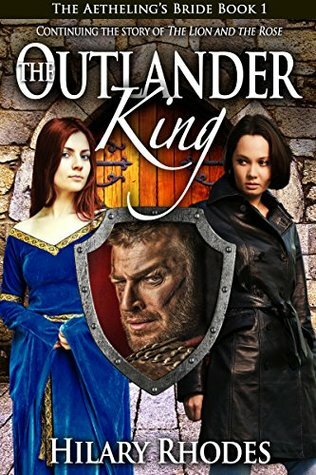 The Outlander King is also a feast and a delightful read for fans of historical fiction, for Aislinn’s breathtaking story will enthrall you leaving you hooked from the first page. I thoroughly enjoyed this historical fiction set in the time of William of Normandy (later known as William the Conqueror). The main story follows a commoner girl, Aislinn, as she is taken away from her home and goes through various personal and historical events to becomes a strong yet flawed woman. Aislinn and her family are fictional characters but most of the rest of the people surrounding her are in fact historical characters, and I really liked the mix of the two. Most of the secondary ch I thoroughly enjoyed this historical fiction set in the time of William of Normandy (later known as William the Conqueror). The main story follows a commoner girl, Aislinn, as she is taken away from her home and goes through various personal and historical events to becomes a strong yet flawed woman. Aislinn and her family are fictional characters but most of the rest of the people surrounding her are in fact historical characters, and I really liked the mix of the two. Most of the secondary characters were also well fleshed out and interesting. There were a couple of Aislinn's actions that had me shake my head and wonder why she would do it, but on the whole, it was a strong and captivating story. The other part of the book is about Selma, an American graduate student studying at Oxford, on a search of the “Aetheling” manuscript, presumably written by Aislinn herself. In honesty, I could have done without that part. I felt like taking a sharp break from the medieval story for Selma's part took me out of Aislinn's story and did not add much value to it. I also didn't connect much with Selma's story and didn't find much of a connection between her story and Aislinn's (it's possible there will be more of an explanation in the next book). Minus the modern day part, I loved the novel and would recommend it for any historical fiction aficionado. I will also pick up other novels by Hilary Rhodes.